Karsha.biz Review – Iranian Exchange Based in the UAE? There’s not much user feedback or community discussion available on Karsha.biz, but from what scarce information is out there, it seems that it might be an Iranian crypto exchange – at least some people at bitcointalk.org seem to think that. Given the political/legal situation in that country, it is perhaps not surprising that the operation is not based in Iran. What is sort of surprising though is that the roots of Karsha.biz reach all the way back to the dawn of the crypto age. According to the whois file of the Karsha.biz domain, it was indeed first registered in November 2009, by the person who is behind the whole effort: Masoud Gheysari. While there is no actual registrant address provided in the whois, on the About Us page of Karsha.biz, we learn that the operation is currently based at: Sheikh Zayed Road, Business Bay, Dubai, UAE. The phone number provided is +971 4 414 6751. Karsha.biz is a no-nonsense cryptocurrency exchange, which lets users convert a staggering number of crypto- and fiat currencies into other crypto- and fiat currencies, more or less at the click of a few buttons. As such, karsha.biz in the same category with exchanges such as Changelly, and judging by the lack of a bad reputation, it does indeed do what it promises. Actually converting your cryptos into another crypto is as easy as accessing the site, entering a few bits of information regarding the amount and the addresses from which and to which the transfers shall be made, and clicking the Exchange button. Payeer and Perfect Money are accepted for the transfer of fiat dollars, and through these solutions, users can indeed purchase cryptos at the site. Cash, bank transfers and credit/debit cards are not yet accepted, but the News page of the operation has made promises towards the introduction of such solutions in the future. Karsha is the name of an ancient Persian gold coin, which served as currency, and which Karsha.biz was aiming to emulate in the electronic sphere, through the Karsha eCommerce Group, which was founded in 2009. Karsha Business and Technology Inc. was launched in 2011, quickly becoming one of the first Bitcoin-based service providers, through its Mobile Payment Interface and Shopping Cart Interface. Karsha.biz’s creator moved to Dubai in 2015, and proceeded to hire a team of 12 developers, network managers and security professionals. The project is currently backed by 26 investors, and it has been proclaimed the biggest cryptocurrency exchange in the Middle East, and one of the biggest in the world. According to the About Us page of the operation, new investors are welcome into the fold too. 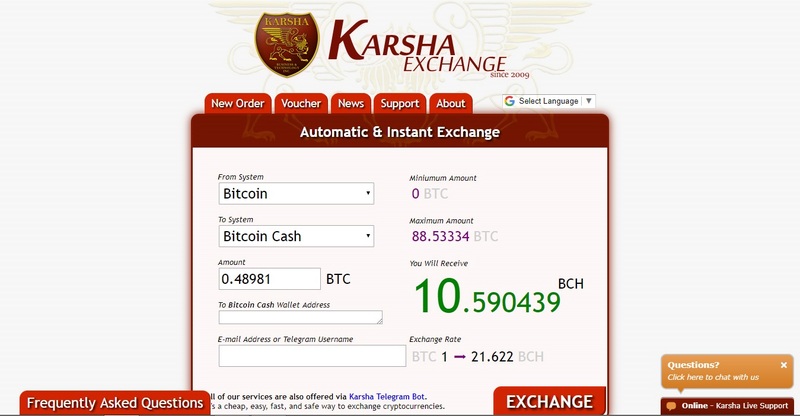 In addition to the exchange service, karsha.biz runs a voucher scheme too, which is about one-time payment vouchers denominated in USD, EUR and BTC. Users can merge and split these vouchers, redeem them and trade them back and forth. According to the Karsha website, vouchers offer users a great way to temporarily liquidate their crypto holdings. This also means they can be used for frequent crypto trading: users can grab USD/EUR vouchers quickly and confirmation free, with their BTCs when the price of the crypto goes up, and then turn it all back into BTC when the price goes down. In all honesty, we haven’t been able to rustle up any relevant feedback regarding this voucher scheme. Judging by what people generally have to say about the operation, the answer to that would probably have to be Yes. In addition to a favorable reputation, Karsha.biz has been featured by a number of prestigious cryptocurrency portals, such as Bitcoin.org, BitcoinCash.org and GetMonero.org, and its transfers seem to be smooth and hiccup-free for the most part. The exchange-side business of Karsha.biz does not really raise any red flags. Transparency is great: users are given actual numbers on their exchange operations (you’ll see exactly how many BCHs you are to receive for your BTC) before they pull the trigger. Maximums and minimums are provided on the crypto/fiat pairs too, depending probably on the liquidity at the disposal of the operator. The actual exchange rate is displayed as well. Orders are set to expire in 10 minutes. To complete an order, all users are required to do is to transfer the required amount of fiat/crypto funds to the provided address. No ID of any kind is required to complete the operation, and apparently, people from all over the world can make use of the service. We haven’t really come across any complaints regarding the services offered by Karsha.biz. If you have anything to share in this regard, please use the comment section below. Karsha.biz’s support can be contacted via Twitter (@KarshaBiz) and email: [email protected] There is a live support widget at the site too, which does not really seem to work though. Karsha.biz looks like a no-nonsense operation, the exchange part of which seems to work as advertised. There’s surprisingly little user feedback available on the operation though and their live support widget does not seem to work. The operation handles wholesale exchange orders too, for which it offers special conditions. What’s your opinion on Karsha.biz? Share it with us by commenting below this review! Read other Crypto Exchange reviews. This website Karsha.biz does not exist and the phone number provided is a wrong number leading to a Spa house.